This utility will only work with a DataFlex database, it will not check SQL indexes. Users may be on the system while the index checker is operating. Be aware that it is somewhat resource intensive so a slow-down may be encountered if run on a workstation being used for data entry or on a WTS server. DataFlex databases are normally very stable, so why do we need such a program? If the users didn't do such silly things as shut off their PCs without first exiting the programs, or have the occasional defective nic card or ran every workstation on a UPS, we wouldn't have data problems. File servers once in a while have the audacity to crash, which can also make life interesting. Going to a client server database would solve a number of these problems, but if that isn't possible, you're going to run into them every once in a while. If it's suspected that there are one or more bad indexes in your data, there are two actions that may be taken. You can either just reindex your data, in which case your users will all need to be off the system for the time it takes, or you can run the index checker which may tell you whether you need to or not. The gain you will get by doing this is a time savings if a reindex isn't necessary, and possibly an indication of bad data if such exists. If your customers are experiencing problems, this utility may save them some production down time if your guess that a reindex is necessary is not indeed correct. The reason for externalizing the menu is to remove all of the normal VDF menu and toolbar options, they aren't necessary for this program. Additional tools may be included in this program, merely add them to the menu, .prj and the .src modules. Or, add this project to your IDE and do it there. For VDF7: Go to the file menu, select "New Workspace", enter "SVC" for the name (without the quotes), "Index Checking Utility" for the description, then choose "Create an all-in-one directory" and use the prompt button to point to the folder where you unzipped this program. For VDF8 Double-click on the file "SVC.ws"
CkIndex.pkg is a class and object that may be included in either a front-end user view or in a back-end program that could be called from an NT service. If file # is 0 all files in filelist will be checked, if a valid number, only that file will be checked. If the Message Object # is populated, the appropriate user screen message is returned to that object. This is useful for displaying busybox messages in the calling view rather than with Sentinel. The code is fairly well documented, and isn't all that complicated, so extensive detail has not been provided here. If run as a service. The class contains function show_errors, which could be easily modified with an argument to redirect the array output from the output box to using Direct_Output to a file. Since this need - continuous data trouble - would indicate that something is wrong with the system or application; this functionality is left to the developer. Double click on FleUtil.vd7 to start it, the following screen will appear. To check indexes, either enter the file number as shown in dbExplor to check a single file, or click "Process" with the file number blank to check all. Depending on the number of records in your files, this could take a while, as each record in each file will be checked. 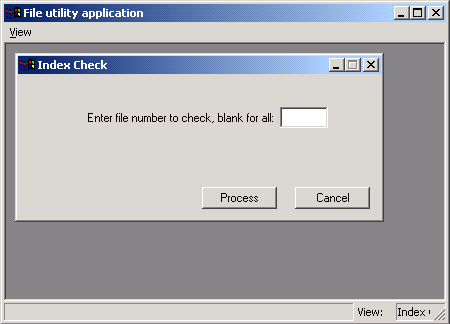 The checker will discontinue checking a file once an error has been detected which is why you may only see one error per index and file. First, look at the record number of the indicated file using dbExplor. If bad data can be recognized, fix the record or delete it and rerun the utility. 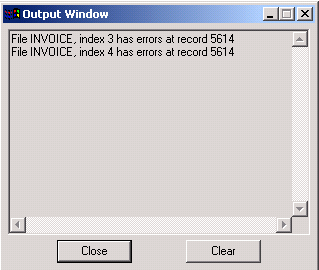 Be sure and use the index shown in the output window. If the data for the record number shown appears correctly, look at other records above or below. Both of these dates have really strange appearing years, but for some reason DataFlex handles them correctly one time and incorrectly the next. They don't cause an error in a data field, but they do not "find" correctly in an index. Other bad data would be something line "5:60" in a numeric field. The colon is incorrect. In both cases, either fix the bad data or delete the record. Rerun the utility and if you get a clean run, you're done. If not and a different record number shows, fix it. If no "bad data" can be found, reindex the file with dbBldr. Rerun the utility afterwards and if a clean run, you are done. If still an indication of a problem, the next step might be to replace the file structure as it may be damaged internally - a dump and reload. How does one test such a utility? After all, bad indexes aren't the "normal" and not everyone has them hanging around. Actually it's easy; there are at least a couple of ways. 1. Edit a file with dbBldr, set all indexes to batch. Create a new record in the file with a duplicate key field. Reindex and check it. Reindexing will inform you that there's a problem. 2. Save a copy of the .dat file you want to test. Delete some records in the file, then copy the original .dat file back in and test.